A new swimming pool installation will provide you and your loved ones with plenty of fantastic outdoor recreational opportunities during the upcoming summer season. If you are getting ready for a new swimming pool installation for your property, you will want to hire a highly rated swimming pool company near Salt Lake City. From installing your pool to performing routine swimming pool maintenance, your contractors can assist you with every aspect of pool ownership. To help you get started on your pool or hot tub installation project, here is a quick look at a pool design and construction checklist. During the initial phases of the pool planning process, you will need to gather plenty of design inspiration for your brand new swimming pool. Rather than designing your pool from scratch, you can look at landscaping websites, home design magazines, and other sources for ideas and inspiration. You may even want to consider creating a notebook to gather all of the pool features and materials that you want to include in your new pool. As you are designing a new pool construction, you will want to make sure that you clearly communicate your desires to your pool contractors. Before the pool building process begins, you can write down a list of the must-have features that you want to include in your new pool. Some popular features include waterfalls, fountains, LED lights and tanning shelves. These features will transform an ordinary pool into a gorgeous backyard oasis. No pool design and construction checklist would be complete without a thoroughly considered layout and blueprint design. The layout of your swimming pool will depend greatly on the size and shape of your backyard. To determine the ideal shape and orientation of your pool, you can use a rope or gardening hose to physically mark off your desired pool area. Once you have seen the layout of your pool in person, you will have a better idea of what it will look like when it is completed. As the days get longer and outdoor temperatures start to warm up, you and your family members may be getting ready to open your backyard pool for the season. 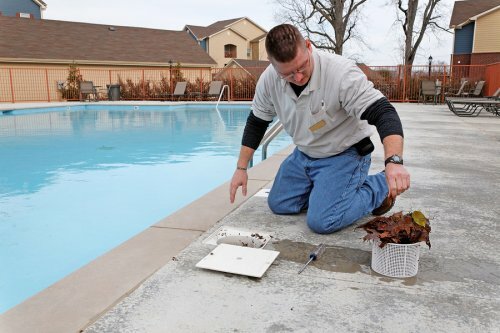 An essential step of proper pool maintenance is to close up your pool during the cold months of winter. Once spring arrives, you can switch on your pool heater, pull off your pool cover, and start enjoying your pool once again. A contractor that offers pool maintenance near Salt Lake City can help you get your pool ready for the peak summer swimming season. 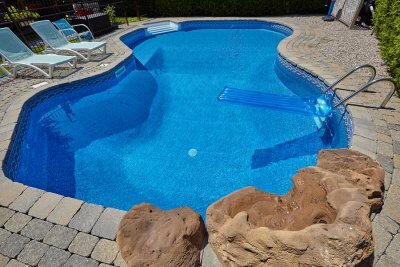 Let’s take a look at some factors that can help you decide when it is time to open up your pool. Keeping your pool closed up after outdoor temperatures have increased significantly could lead to a maintenance problem with your pool water. Warm air can raise the temperature of your pool water, which will create the perfect breeding ground for algae. To avoid opening up your pool to find a mess of green slime, you will want to open your pool as soon as it starts to get warm outside. During April and early May, you may be deciding between opening up your pool on a sunny day while weather averages are still low or waiting until the weather is consistently warm and sunny. To decide when you should open your pool for the season, you may want to review the weather forecasts for your local area. If sunshine and warm weather is in your weather report for the coming week, it may be the perfect opportunity to open up your pool. Before your first big get together during the spring or summer season, you may want to get your pool open and ready for your guests. By opening up your pool for an event with your family and friends, you can treat your loved ones to a day of poolside fun. If you have an upcoming party planned at your house, now is the time to start thinking about opening your pool.